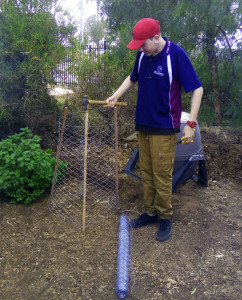 As part of learning about Healthy Eating and Lifestyle (HEALS) choices in the YES Centre, students have been growing vegetables, fruit and herbs. The garden was originally established by YES student Sean Langdon four years ago and HEALS students have now taken it over. They will eventually use the foods they grow in cooking and learn the benefits of being sustainable. HEALS teacher Mr Mitchell Johnston said students have relished the outdoor activity. “They enjoy the opportunity to get outside and enjoy the sun,” he said.